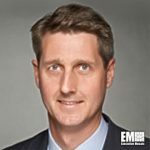 David Hathaway, a 14-year IBM (NYSE: IBM) veteran and a former public sector application lead in its global business services segment, has transitioned into the role of vice president of defense and intelligence for the GBS organization, an IBM spokesperson has told GovCon Wire. Hathaway started the role April 1 and will oversee program delivery, sales, profit-loss management and product investment functions for the GBS segment’s business in the U.S. defense and intelligence markets. He previously led the segment’s public sector application development and innovation service line for one-and-a-half years and also served two years as head of the company’s public sector business in Canada, where he led service delivery for federal, provincial and healthcare clients in that country. Hathaway first joined IBM in 2002 upon that company’s approximately $4 billion acquisition of the consulting practice at PwC in a deal that formed the nucleus of IBM’s GBS segment. During his eight years at PwC, he held project and program management roles in areas such as consulting services and software development with a focus on customers in sectors such as federal government, financial services and transportation.